AutoRunWizard.com - AutoRun Wizard FAQ - Can I autorun multiple files with AutoRun Wizard? 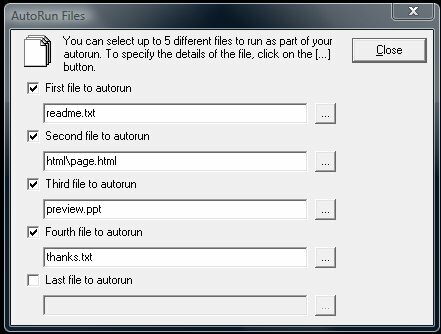 Yes, AutoRun Wizard supports running up to 5 autorun files when the cd is placed into the cd drive. Select the Auto Launch tab, select the option to "Launch File(s)". Next click on the Configure button to configure the properties for the autorun file(s). From this screen you can select the files you want to autorun, in order.